It will be interesting to see how this unfolds... If it is schizophrenia, I wonder if anyone noticed the NEGATIVE symptoms that often occur first....poor grooming,etc....He obviously had it thought out. So tragic. 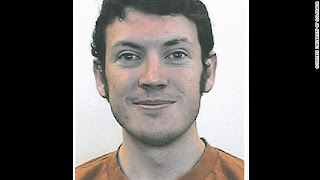 In this picture, he LOOKS sociopathic. Of course, I know better than to make that assumption merely by his look. He just looks, well, GROOMED. Determined. The thing is, not everyone who has schizophrenia is poorly groomed, only the ones that are off meds for a long time, have poor support systems etc. R/O Schizoaffective Disorder or Bipolar etc. Its complicated but I agree that this man was on a collision course with destiny. I believe his parents knew, the school knew and he fell through the cracks. Perhaps he was withdrawing from school because he was decompensating and the University was ushering him to the door. government can take steps to protecting the public. I hope they don't blame BPD, because it has a bad reputation already and we that have it, are constantly struggling to fight the stigma. I bielive if the diagnosis is sczyophronia the drug tests will show that he was off his meds. Not sure which type he had but as a student of Nero science he was at a level that allowed him to study his own disease , and learn what was down the road for himself! My sister has it but her voices are controlled with meds and would hurt a fly. Her issue is self infictiing n by that she mostly just hits her ears before next scheduled meds are due when we are coming up on a meds change for the year! Doesnt schizophhrenia begin, most of the time, in a person's early 20's? Isnt it discovered alot when a person is at college? Maybe he wasnt even officialy diagnosed yet. (If that is infact what is wrong with him). For someone to sit in their apt putting up a web of trip wires among other things and then shooting ppl in a theatre,something is obviously wrong. From everything ive heard it seems like he wasnt this evil person up until this horrible massacre. So my question is what could make someone go from quiet to murdering psycho? Thats a huge leap. Was it "voices" in his head? So damn sad. I cant stop thinking of those poor ppl being slaughtered and this man so easily taking their lives. Two things to consider. If the schizophrenia contained an element of paranoia, James may have been reluctant to tell anyone or get treatment. Secondly, even if he did tell his mother, for example, about delusions he was experiencing, he could not be forced into treatment unless he was an immediate danger to himself or others. Lastly, even if he did get treatment, an unusual response would be difficult to predict. There is childhood schizophrenia, and it begins with hearing voices as a child, or seeing things that aren't there. It is possible James always had the disorder, but still functioned well academically. Premorbid. We used to think that bi-polar disorder only presented in late adolescent or young adulthood, but now some are diagnosing this disorder in childhood as well. Depending upon the flavor of the month, some doctors will diagnose anything. That said, they are sometimes correct. I personally don't like labeling kids. They're all crazy. Both schizophrenia and bi-polar disorder are likely to be exacerbated and manifest with stress, and launching to adulthood is the first serious, life-changing stressor for most of us. I think what we may be seeing (and I wrote about this following the massacres at the University of Virginia, Northern Illinois University, and Laughner's parking lot assault on Congresswoman Kathy Gifford) is that our culture glamorizes violence. It sells, for one. We are inundated with it in so many forms, and it is stimulating. Identifying with it, being comfortable as an aggressor, a powerful person, feels better than being fearful of the receiving end. Violence is a way of communicating identity, too, and identity, at this age, for less mature personalities, is about who we identify with. For someone with a mental disorder of psychotic proportions, identifying with violent people, this mode of communication, isn't so extraordinary. Violence is a discharge of emotion, a release of stress, anxiety and anger. Those of us who have learned to manage these emotions without violence can live peaceably, even in a violent world. But mental illness robs us of our desire to control our drives, renders us powerless, slaves to inner voices, the madmen, madwomen, inside. Thanks for all of your comments. I'm still interested in hearing more of them. Obviously I'm more comfortable with the idea that these massacres are a manifestation of mental illness than psychopathy or evil. But we have no idea how this young man was raised, what he saw in his 24 years of development, or what he learned about people. Blaming the genetics, assuming biological disease like schizophrenia or bi-polar disorder, is still, at this point in time, just an assumption. Not that psychopathy isn't mental illness. But criminals who are psychopaths have to be jailed, not enough medication in the world. The mentally ill, even when they have killed others, can usually be treated. I have a 26 year old son with Asbergers syndrome. He has managed to get through college but like James does not function whatsoever in the real world. His level of Socialization is zero. As a loner our family tries to stimulate him as much as possible. But James Mother knew and stated that she expected her son was to blame from the onset. She then must of known of his mental instability. As with my son, non violent tendendcies, no auto wrecks or even tickets but a shallow and lonely existence he has created. As for comparison sake, he was disgusted with James but believed immediately that he probably was bullied or mistreated by his family members.Still. people are very complex and my son is not the exception...I pray he will find peace and control unlike this sad figure. I believe that it is really up to us, as a society, to begin to understand and accept, even cherish kids who are different, and assume (this time it's a good thing) that adults who appear different, or odd, probably have good reason. I hope your kid finds a niche and something he likes to do, continues to try to understand us and why we behave the way we do. But I hope even more that the rest of us learn to love, not bully, people who are different. For all we know that IS what happened. For whatever reason, James Holmes decided that joke is on us. Off topic as to the shooter's mental health; but what can we say about the mental health of the father who put his month old baby down after the shooting started and left his girlfriend with the 4 y/o and the baby. By left I mean DROVE AWAY !! And then proposed to his girlfriend at the hospital where her gunshot wound was being treated. Maybe that would go under forgiving people their differences? No idea, but for all we know he's a war veteran and lost it. I would bet that is that case, actually. @anonymous.... my thoughts EXACTLY after seeing that couple interviewed on the news last night did you notice how serene she was, and how totally affected he behaved? I felt his omission was a bit contrived. I can't believe he put the baby down and ran while his injured girlfriend saved the kids. I agree with your assessment. I just wanted to add that it is likely that his past pattern was premorbid and that he had a break over the last few months. This is a very strong case of delusions of grandeur. I also believe the school knew something was wrong. The sad part is that if they had investigated further or referred him for therapy, he might have been diagnosed. This kid was never diagnosed or held for danger to self or others. You can't buy guns legally if you've been hospitalized. He bought the guns legally. I don't think he was ever medicated and off his meds. This was his break. The other sad thing is that the rate of violence among people with schizophrenia is lower than the general population but when something like this happens, everyone focuses on the mental illness. I've thought that it seems likely that Mr. Holmes is probably schizophrenic but not yet diagnosed. Maybe he's been concealing his delusions. 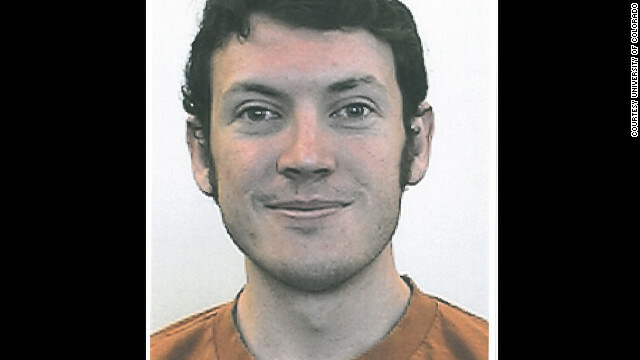 If he is schizophrenic, I find it troubling that people refer to him as "evil". If he is schizophrenic, then what happened is the result of psychosis. I think when people describe someone as "evil", then maybe it makes them feel/believe that the other person is not like them and that it is not possible to treat them, and therefore it would not be possible, by normal human means, to prevent this kind of tragedy from happening. But if Mr. Holmes is schizophrenic, rather than evil, it means that all of us need to pay attention to each other, all of us need to notice what is going on with those around us, not in an intrusive way; not in a way that is like spying on our neighbors. We need to notice those around us with compassion. And when we notice that something is not right, then we may need to take steps to help in whatever small way we can. I'm reminded of a situation years ago, when in college, and one of my classmates, a white male in his early twenties, came to school one day and something odd seemed to be going on with him. He was a slightly odd young man even before this particular day. Not bad, not a bad person, in fact fairly polite, but something about him seemed odd. I noticed that he was trying to engage various people and they would walk away after he said whatever he said to them. I needed to go to a sink he was standing next to and when I did, he began talking to me, too. He started telling me that he was sure there was a growth in his throat and that it was growing rapidly. He wanted me to look in his throat and wanted me to see if I could see it. He plainly wanted reassurance. So I looked in his throat and as I suspected, there was nothing to see, yet he was clearly alarmed and anxious and his general behavior was odd. I didn't think he was dangerous but I thought he might be having some sort of mental health problem. And I thought so based on experiences of the brother of a boyfriend, the brother diagnosed as schizophrenic. I'd seen him in full blown psychosis before and knew what that could look like. So after reassuring the classmate that I could not see a growth, I went and told teachers and administrator that I thought something was wrong with the classmate and I explained what he was doing. They did take it seriously and took him in their offices. I understood that his family withdrew him from school and he did not come back. We need to be aware like that. @Mound Builder.....I agree %100 and couldnt have said it better. I am a psychiatric nurse and this guy appears to me a text book case of schizophrenia with first major psychotic break. Colleges, highschools, and parents really need to be educated on this disease. His parents could know, but not be able to do anything about it. It is also very likely that his school peers and instructors may have been privvy to odd things he said or did leading up to his withdrawal from school. Someone has to present a clear danger to himself or others to be involuntarily treated. Some schizophrenics are able to hide, and even cope with their hallucinations/delusions and have fairly successful lives. Simply having hallucinations or delusions is no longer a reason to hospitalize or treat someone who does not want treatment. Unfortunately if this is the case with him, his were to the extreme and unless thee is history, it cannot be predicted. I just can't help but wonder what if... what if a girl who thought he was cute-sat down next to him and struck up a conversation before the movie OR what if some of his grad school classmates would have seen him and invited them to go sit with them-- would this still have unfolded the way it did? It's like the butterfly effect- how one small choice/action can change the course of lives. Great thoughts. Butterfly effect in particular, and Moundbuilder, what an awesome intervention. I think that we're getting closer to mandatory public education about mental illness, but the treatment of this case, even two days later, the reluctance to label disease (by the media), speaks to the political incorrectness of that, stigma. So in the interest of avoiding that, possibly stigmatizing people, we'll have to stay in the dark ages, stick to language like "evil." This may make me a bit unpopular, but someone posted on my Facebook wall that "If he were Middle Eastern/Arab/Muslim, he would be a terrorist. If he were Black/African American/Hispanic/Latino or Asian, he'd be a gang banger. Because he is white and in college, he is "mentally ill". This is why I believe that involuntary commitment, contrary to how the laws are written nowadays, should be expanded on a case by case basis. Having completely bizarre beliefs about the nature of reality is one thing. Schizophrenia is another and is remarkably identifiable. My friend is schizophrenic and too paranoid to take medication, which is weird because he will try any substance. If there were only an antipsychotic that could be smoked, he would try that! He also has fantasies which include a "dark night," but are of a non-violent nature. However, he even realizes that he becomes completely confused and can't tell the difference between what is real and what is imagined. At this point, I believe the disease is interfering with his ability to function. I'm disappointed with the inability to do anything about it. One thing we should think about, have mass shootings increased once the laws regarding involuntary commitment were tightened. In the 1970s there were 13 mass shootings. In 1979 involuntary commitment laws were made stricter. In the 1980s, the number of shootings jumped to 32, in the 1990s to 43, and then declined back to 24 in the 2000s. Please look into this, the answer may be in front of our eyes. Thanks Porcini, and oh, I agree Anon. In some states, people with very severe illnesses are not hospitalized, are not restricted in any way from, say, bringing dead animals and garbage into a home that has been inherited, that will soon be lost and/or condemned, all ultimately lost to other surviving, powerless-in-the-eyes-of-the-law, siblings. We have to do better, and it is rare that we can "befriend" sick individuals to keep an eye on them. Paranoia defines a certain type of schizophrenia, and the sufferer trusts only the voice in the head. Meds are key, of course, but a person has to take them. Porcini, you'll be interested to know that when I read about these things the first thing I think is. . . I sure hope he wasn't Jewish. To my mind, everyone in that theatre was a victim including the shooter. I thought the movie "A Beautiful Mind" did a great job of illustrating just how insidious a disease schizophrenia is and how difficult it can be to detect, particularly in an otherwise very intelligent individual. I thought it helped as well to dispel some of the stigma of the illness. Obviously, a person in the throes of this illness is completely powerless to behave rationally and must be held blameless for their actions whilst ill. The man who beheaded the passenger next to him on a Greyhound bus is horrified, now that he is well enough, to realize what he did while he was very ill. There will always be as yet undiagnosed schizophrenics in our midst. I think we need to look at the elements of which their delusions are made as well as their unfettered access to guns. Ironic and telling that when the shooting started, many in the theatre thought it was part of the entertainment. When gratuitous violence is considered entertainment and gunfire substitutes for plot, character development and content, then Houston, we have a problem. him evil and wanting the death penalty. We welcome students around here. And thanks for that head's up about A Beautiful Mind. I completely forgot about that movie. Fabulous, wasn't it? I don't really know about this man, and to be honest I haven't spent a lot of time wondering. I just got to my job as a resident at the Children's hospital closest to the shooting the morning after it all happened and listened to my colleagues talk about what happened overnight avoiding my own unreal feelings of shock and fear and responding in anger to the texts from friends who wanted gory details from my privileged position as an employee on the inside (to be fair I got a ton of texts from friends making sure I was okay...). I listened to the guy who works in the microbiology lab extemporaneously tell me in shock about how the labs at the U this guy worked in were shut down that day when I called him to ask about labs on a patient. I switched to working in a local ER last night and sat across from a patient who intermittently cried and lashed out at me in anger as the trauma of having lost someone in the Aurora shooting drove them to our doorstep in desperation. I don't know what's wrong with that man and I doubt knowing would help me be a better doctor, but my job was and still is to listen to a long string of people in pain often not having much to offer, but knowing only that this too will take much love and much time to heal.